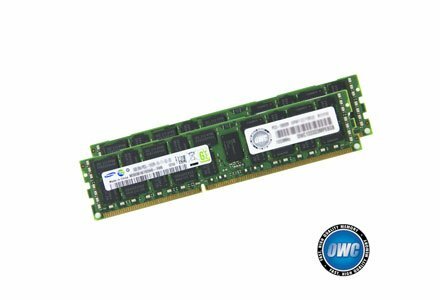 Product Specs: 8GB (8192MB) : 240-pin : SDRAM DIMM 1024M x 72, Dual Rank ECC Memory Module : Data Rate = 1066MHz : Module Bandwidth 8.5GB/s : CAS 7-7-7-20 : Voltage 1.5V : Apple Specified Thermal Sensor* : RoHS Certified : Free Installation Videos & Manuals : OWC Memory Lifetime Limited Warranty including Advanced Replacement Program : OWC Memory for Mac Pro Quad Xeon fully meets Apple's specifications with special attention to proper thermal specifications. IMPORTANT OWC NOTE: OWC p/n OWC8566D3MPE8GB 8GB modules require that all installed modules be of this same matching part. Other existing Apple or 3rd party 1GB, 2GB and 4GB modules are not supported for use with this kit and need to be removed when this kit is added.